The Biblical World: Did Jesus get mad when asked to heal people? A friend of mine recently asked me a question about Mark 1:41. He was reading the verse in the 2010 NIV on his cellphone when he noticed something that struck him as odd. A leper says to Jesus "If you are willing you can make me clean." The narrator then describes Jesus as "indignant" as he stretches out his hand and says "I am willing. Be clean!" My friend was taken back because when he had read that verse in other versions it said that Jesus was "filled with compassion" not that he was indignant. This seems to be a significant shift in the atmosphere of the scene. Jesus is no longer presented as compassionate but annoyed. What is the new NIV doing? It seems that the translators have chosen to use a less widely attested reading. While there is more textual evidence for describing Jesus as "'compassionate," some NT scholars think the description of Jesus as "angry" is more accurate. Let me explain. In the context of the story, describing Jesus as "angry" seems to fit some of the other vocabulary. In 1:43, after Jesus has healed the leper, Jesus "upbraids" or "sternly warns" the man and then sends him away. Actually, the terminology is "drove him out" the same description of what the Spirit did to Jesus after his baptism. Thus describing Jesus as "compassionate" in 1:41 does not seem to fit with his actions in 1:43. It is easier to see an angry rather than compassionate Jesus scolding a man and driving him out. Bruce Metzger was not so sure. In his textual commentary he notes that it is easy to understand how a scrupulous scribe might substitute the word for "compassion" in place of "anger". On the other hand, it is hard to account for someone substituting "anger" for "compassion" (p. 65). Thus anger might be the original reading. But he also points out that Jesus gets angry in Mark 3:5 and 10:14 and scribes did not find a need to change that terminology. Thus, English translations from the KJV on have described Jesus as "compassionate" here rather than "angry." 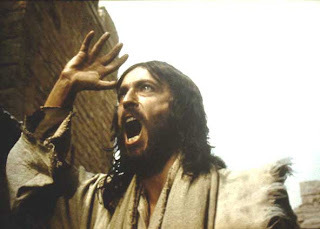 But the NIV 2010 and the CEB both are now describing Jesus as angry here. Why Jesus might have been angry is difficult to say. Perhaps he was mad that the leper questioned his willingness to heal him? Or maybe Jesus was annoyed that his preaching tour was being interrupted (1:35-39). The reason is not stated and thus may explain why, if "anger" was the original reading, it was changed by a later scribe. There is no clear explanation for why Jesus should be angry with someone seeking to be healed. But he does exhibit compassion to those who he ministers to (Mark 6:34; 8:2; 9:22). In his commentary on Mark R. T. France suggests that Jesus was angered by the suffering that the disease and society had inflicted upon the man (p. 117). But this fails to explain why Jesus than "upbraids" the man and "drives him out" in 1:43. Yet, this is a rather odd section of Mark. In the paragraph prior to this one Jesus goes off to pray and stays there till his disciples find him. When they tell him "everyone is looking for you" he replies, "let's go someplace else to preach" (1:38). We are accustomed to thinking Jesus wants to be found by those who seek him. But in Mark 1:38 Jesus does not want to be found and it is possible that he gets angry at those who question his willingness to heal them. It will be interesting to see how acceptance of this reading plays out in teaching and preaching. Some NT scholars, like France, have already incorporated it into their commentaries. But what kind of a rethink will it require for us as we now encounter a Jesus who possibly gets inexplicably angry? This is not the Jesus that is often portrayed today. But it may be the Jesus of Mark's Gospel. Ah, ya gotta luv Mark. If the writers of Matthew and Luke felt a need to 'tone down' some of the Markan material, it very well may be that some scribe thought it necessary to do the same. Honestly, I appreciate the Markan Jesus in many ways. He is more 'human' than the other evangelists portray him. He has trouble with those hard-headed disciples. He's always moving about quickly...maybe even impatiently. Describing Jesus as indignant with someone does seem to fit with this gospel. Great thoughts. After my study of Mark I couldn't agree more. Rikk Watts, a NT scholar at Regent College in Vancouver said Mark was the closest thing to an Aussie we have in a gospel writer (Rikk himself being an Aussie). Real, gritty, unapologetic, and refreshingly authentic. I think if he was angry it was because he would be frustrated that the man could ever think Jesus could not love him or anyone enough to not want to heal them. Keep in mind that one of the things that seemed to consistently frustrate Jesus (when he did show it) was people displaying a lack of faith/doubting his love. I believe this could be a source of frustration because God requires our faith and trust to use us for His glory. I have to agree. Although the evidence is not as strong, it does seem to fit better with the context. In Mark 1:34 Jesus drove out the demons but wouldn't let them speak of who He was. Could there be a relationship with 1:43 where Jesus didn't want the leper to tell anyone? If Jesus is fully human shouldn't he have feelings of anger and annoyance? Can't He have a "bad day?" It doesn't mean He didn't still love the leper. I like it, "The Indignant Bible". Your observation about Jesus silencing those he heals is part of what is known as the Markan Secret. Jesus does not allow anyone to reveal his identity. Even when Peter discovers Jesus' identity in 8:31 he too is silenced. Or maybe Jesus was annoyed that his preaching tour was being interrupted (1:35-39). The reason is not stated and thus may explain why, if "anger" was the original reading, it was changed by a later scribe. There is no clear explanation for why Jesus should be angry with someone seeking to be healed. But he does exhibit compassion to those who he ministers to (Mark 6:34; 8:2; 9:22). It's a rebuke, similar to the rebuke to the unclean spirit in the synagogue exorcism that precedes this healing. Here in the opening of the narrative, we are witnessing the power of Jesus to command, rebuke and cast out all of the forms that the corrupting influence of Satan may take; Jesus is "binding the strong man." We are accustomed to thinking Jesus wants to be found by those who seek him. But in Mark 1:38 Jesus does not want to be found and it is possible that he gets angry at those who question his willingness to heal them. The issue in 1:38 is not a misunderstanding of his willingness, but the disciples' failure to perceive the nature of the mission. Again, there is continuity here with the temptation in the wilderness and the idea of Jesus as God's agent in a cosmic struggle with Satan. The disciples here are thinking of a magician, a self-powered wonder-worker who can heal at a touch, and who ought, by rights, to be out exercising his fantastic powers. By having Jesus go away and pray in an empty place, the evangelist is making plain what is the source of Jesus's power to heal. It comes from Jesus's uniquely close relationship to God. This is a standard Greco-Roman polemic against the charge that a divine figure is practicing magic (a charge the scribes make explicit in Chapter 3 when they say that Jesus is possessed). Jesus's irritation is a product of the disciples' focus on the miraculous activity itself, and their failure to understand the true meaning of Jesus's healing and exorcising. Today's NIV (2002) and the "Voice" NT (2008) also go with the reading of anger/indignant in Mk 1:41. I too think the reading of anger fits better throughout Mark. Jesus rebuffs the Syro-Phoenician woman rather roughly in Mk 7:24-30. Jesus groans/complains in Mk 7:34 while healing the deaf mute man. Jesus groans/complains when questioned by the Pharisees in Mk 8:12. He curses the fig tree in Mk 11. The Markan Jesus comes across very confrontational and combative, certainly not meek and mild. And regarding his solo excursion for prayer in 1:35-36, I think that's another example (of many) in Mark of Jesus attempting to escape the oppressive, harrassing crowds. He has to get up early before sunrise to pray apart from the crowds in chap. 1. He and his disciples can't even eat, sleep, or rest due to the crowds. The paralyzed man is let down through the roof due to the crowds in chap 2. His own family in chap. 3 can't get to him due to the crowds. He has to teach from a boat and use the water as a barrier due to the crowds in chap 4. He takes 6 boat trips in Mark to get away from the crowds (not to go on mission trips). The only person he doesn't silence is the demonized man in chap. 5 but that's probably because he's only briefly over in Gentile territory. It sounds like the reason he goes to Caesarea Philippi and Tyre & Sidon is to get away from the crowds. So I think some of this aspect of the oppressive, harrassing crowds factors into his rather terse encounters at times. I guess you see I don't read any NIV much. I was only alerted when someone asked me about it. I can see your point about the oppressive crowds.I had not thought about 1:35-36 in that context. Thanks! Dr. John, Perhaps u can point me to some sources to check this. In BDAG, σπλαγχνίζομαι has only 'have pity, feel sympathy...with of for someone.' There's nothing about indignant or any other definition. Perhaps it's something from an extra-biblical source? So this prompted me to go to several translations. NLT puts a footnote in "Some manuscripts read "Moved with anger." The NRSV "Moved with pity...." The NEB: "In warm indignation...." Hmmm, "warm indignation," a joinder of the two? N.T. Wright, in his commentary on this passage makes some interesting points -- that it all has to do with "leaks" somewhat like trying to please the people and gaining media attention. That even perhaps his disciples were trying to "leak" his prominence. Wasn't it, after all, publicity he was seeking? "Why did he tell the poor man so fiercely?" Why "warned him sternly?" It has to do with not saying anything. Perhaps there are times to be silent. Hadn't Jesus gone away to be alone to pray. Our teaching reminds us to look at the previous passage and the following passage to gain a better perspective. In the following passage, Jesus heals a paralyzed man and calls him "child." In reading the "whole" of Scripture in relation to this single sentence allows me to see that Jesus can be indignant - more so with his disciples (which isn't the only time) and not so much with the people who are in need of healing. Perhaps it will help us to see others in this same light; when they are pushed to do something that they have the power to do, but feel pressured by us or others to do something simply for doing it rather than there being a better time. No you are correct. What is going on here is that while σπλαγχνίζομαι is the reading with more evidence,oristheis (anger) is a variant that also appears. NT scholars are suggesting that the second reading may well in fact be the original. It's about the "messianic secret" isn't it? in Mark Jesus spends the first half of the book telling everyone to keep it secret who he is and how powerful he is. Just running across this blog on 1/14/2012 because I, too, was curious why Jesus was said to be "indignant" with the leper who asked to be healed. I am not a Bible scholar, but am a middle-aged mom who has lived and raised three sons, and have studied the Bible to better understand my Lord. Could it possibly be that we are trying to over analyze things here. Jesus is fully man, and fully deity. Agreed? Anger is a human emotion. Yet, God himself is known to have become angry. And he is deity. We were made in His image. I believe from my readings of the times Jesus appeared to become angry, that his anger was righteous anger. There is a difference. We are also instructed when we become angry (because as humans it is expected), to not sin in our anger. I've heard on the arguments on the clearing of the temple - but I believe Jesus acted purposefully in that instance to make his point. The house of God shall be a house of prayer. In the instance of the leper, and the pressing of the crowds, I believe Jesus absolutely had compassion. Yes, he felt tired and exhausted at times (as Man), but could it be that he is always "willing" to heal, that is not the main point. Suffering will always be with us because we live in this world. But his main focus was not so much the healing of our physical infirmities, but the healing of our hearts. Jesus' main message and reason for coming and living among us was to repair the bridge of our hearts and restore us to the Father. It is and was always his First Purpose to do the Father's will, and not his own, to focus on healing our hearts and thought-life. To get us to see things in the Spiritual realm and not so focused on the physical. I believe if he expressed indignation at times, that, like with doubting Thomas, he wished whole-heartedly that his people would believe in Him, and not so much in his miracles. To be kingdom-focused more so than physically-focused. "My beloved, I wish above all things that you would prosper, even as your soul prospers." He absolutely cares, but I think he wants our focus to be on our hearts more than our physical well-being. I to came across this passage and had questioned why would Jesus be indignant. As I read the posts I finished reading the passage. Then this thought came to me. At the end of the passage it says that Jesus could no longer enter a town openly but stayed outside in lonely places. So after healing the leper he could no longer go into towns where he could be more personal and healing many in a single visit like it says two passages earlier. Maybe he knew that once he healed the leper that He would no longer be able to openly visit towns, be more personal and heal multitudes. Maybe he knew after this event he jad to move on to the next phase of his ministry. I believe Jesus was angry because the leper violated the Mosaic code by entering the village to see Jesus, thus opening the entire populace to potential infection and ceremonial uncleanliness. We can see that Jesus is concerned with Moasic propriety since he directs the leper to go to the priest who is the only one who could pronounce him healed and then able to re-join the community. I think listening to this portion of the scripture by the reader of the NIV version also amplified that word ('indignant") and drew my attention as well, hence I came to this blog. The point that many have here made is that, yes He(Jesus) was a human being fully and deity fully, so it need be that He should "feel" the same way we do, anger! Yet He did not sin as the scripture tells us that we should be angry but should not sin. The actions of the leper by going out of his comfort zone(outside the camp in the OT) must have angered the Lord, yet he showed compassion to the leper to heal him. So all in all the translation can not be far off. This is my 2 cents! Indigent struck me this morning too, as we read this Scripture. But, the verse does not clearly say he was indigent at the leper. Could he have been indigent for how this man had been treated by society and compassionate at the same time -- showing a different way. If you won't do it, I will. Touch him. Am I the only one who sees that Jesus' indignation is directed at the absurdity of the leper's question, "if you are willing"? His first response is "I AM willing!". Jesus anger is not directed at the leper. Jesus is angry that, in his society, in order for a leper to be declared clean, he would have to go to the priests. The fact that the leper is daring Jesus to heal him indicates that he has already been to the priests, been turned away, and now doesn't believe that anyone will heal him. Jesus' frustration is with the system - the lack of justice available for this poor outcast. This is why, after saying "I am willing" (as opposed to the religious leaders) Jesus in fact tells the leper to report to the temple. Jesus, as always, is angry at injustice. He is angry that this marginalized person could not even make us of the social and religious systems that were too corrupt to help him. I was reading the gospel of Mark this morning and came across this verse, and it was the first time I have ever been struck by the wording (or more probably the first time I've read the newer NIV translation). I wanted to know a little more about the word used and so did a google search and came across this article. I don't really find the explanations here satisfactory, but it seems that in all likelihood the usage of the word indignant is probably correct. I don't pretend to be a theologian, but I do know that while Jesus was human, he was also perfect, so I can't see him being angry for reasons that are not holy. Maybe Jesus knew the leper was, like the Pharisees and teachers of the law, simply looking to be outwardly 'clean', and Jesus's anger was directed towards the lack of desire to lead an inwardly clean life as well. This makes sense to me because it is one of the only places I have found where Jesus also instructs the healed person to present themselves to the priests afterwards. Not only that, but you can see that the immediate disobedience of the cleansed man interrupted the work that Jesus was accomplishing and he had to leave the area. I now have a less difficult time understanding Jesus' anger, than understanding why he healed the leper in the first place. :P. Of course, like the article states, though I may have many theories and reasonings for Jesus' indignation, I just have to satisfy myself with not really knowing. Maybe the leper came to Jesus wanting the miracle but not the man. Like many Christians today, they want the get-out of-hell-insurance, but refuse to surrender their wicked ways. Jesus was indignant before, when he whipped the moneychangers out if the temple. It was a righteous anger. Perhaps in this instance, he is righteous to be indignant at the leper's unrepentant heart, but compassionately gave the man all that he wanted, the healing of his body to do more evil, nothing for his soul. When Jesus healed the 11 lepers, only one came back to call him lord. Many in the crowds that followed Him were the same, only wanting a meal and a miracle. Mark 9:19And He answered them and said, "O unbelieving generation, how long shall I be with you? How long shall I put up with you? Bring him to Me!"